Temperature and Hi Limit sensor for all Jacuzzi Select Series hot tubs. Both sensors fit on a common plug. 24" hi limit cable with a 1/4" stainless bulb that fits in a clip on the heater mainfold. 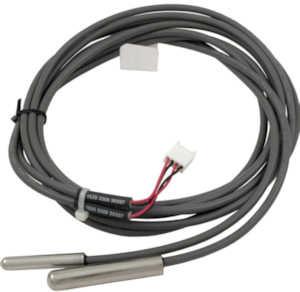 96" temperature sensor cable with a 3/8" bulb generally fits in a grommit on a filter box, or can be used in a sensor well mounted directly to the spa wall.